Inventory We are a resale marketplace, not a box office or venue. Ticket prices may exceed face value. This site is not owned by US Bank Arena . U.S. Bank Arena (known originally as the Riverfront Coliseum 1975 through 1997, and known later as The Crown 1998 and the Firstar Center 1999 200, is an indoor arena located in downtown Cincinnati, Ohio along the banks of the Ohio River next to the Great American Ball Park. Completed in September 1975, the arena seats 17,556 persons in the round. It is the largest indoor arena in the Greater Cincinnati region. It was the home of the Cincinnati Stingers of the WHA from 1975 1979. Since then, the arena has hosted another minor league hockey team and various concerts, political rallies, tennis tournaments, figure skating, a Billy Graham Crusade, and other events. In 2015 a 200 million dollar face lift was proposed by the arena's owner. 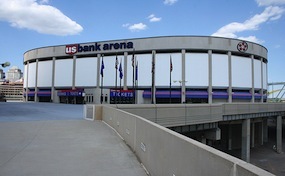 Although unsuccessful initially the US Bank Arena should be seeing a sizable capitol infusion in the coming years. USBankArenaCincinnati.com is not affiliated with any primary box office or supplier. We are a privately owned and operated business specializing in sales in the secondary market. To buy tickets for any US Bank Arena events in Cincinnati simply click on the event of interest or call our operators at anytime.